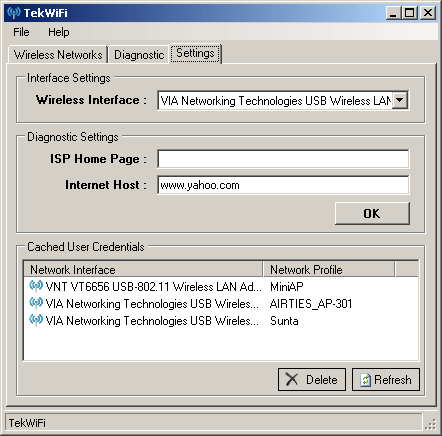 Click here to download TekWiFi. TekWifi automatically selects WiFi interface. Run TekWiFi by double clicking TekWiFi.exe. Select wireless network to be connected and double click on it. Enter Key for the wireless network or configure parameters for PEAP authentication. Click Connect. Enter login credentials if needed (PEAP authentication). Click Diagnose for diagnostic functions. WiFi interface, ISP homepage and an Internet host can be set at Settings tab. 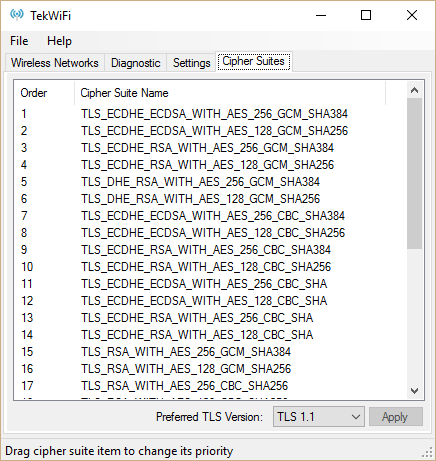 You can change priorities of cipher suites used in PEAP/EAP-(T)TLS authentication methods in Windows and you can specify TLS version (1.0, 1.1 or 1.2) to be used in PEAP and EAP-TLS. You can remove cached credentials used in PEAP autentication through settings tab. Please see http://support.microsoft.com/kb/823731/en-us for details.